Stringing Fool: Focus on Life: Beautiful Old Thing! Focus on Life: Beautiful Old Thing! Sally Stitch Comes Home to Stay. There is always something so intriguing about old things. Whether an heirloom or flea market find we are always intrigued by the back story of the piece that has caught our eye and the thrill of a possible story of family history, lost love or travel to forgotten worlds. In the rust is character, scratches and dents are their badges of courage and the bare metal exposed by peeling paint is acceptance of time. Last week I was cruising Craig's List for yard sales, and standing off to the side in one of the pictures, was this beauty. Not so beautiful you say? Well and girl can dream, can't she? Think what she once was, and what she can become! To see what others have done with this concept click here: The Studio Sublime. LOL Beti....I think your old girl is feeling a little like me today! Bit of a bum hip...I'll get over it, and I bet she will too! Cool find! Can't wait to see what you do with this gal. Oh the sights she has seen, the things she has worn! Awesome find! For sure update us about what you do with her! Erm, yeah, I gotta say she's not so pretty anymore :P Waiting to see what you transform her into! a great find and a wonderful subject for this week's prompt! SO did you buy her? 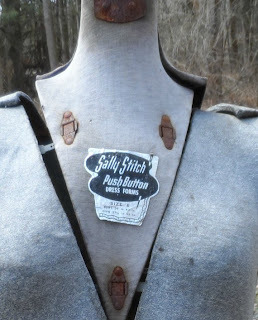 I have a manniquin that I bought when Eaton's was selling out .. she's actually my size... her name is Prudence. She lives in an eligant long green dress. which unfortunately isn't a good backdrop for photographing jewellery against! Oh yes, she has found her home! Oh she truly is an aged beauty!! I'd love to find one similar,...for a price I could afford, that is! LOL!! Please do keep us posted w/what you do w/her. Wonderful find in all her old gloriful self. Bad hip, but still a beauty! Dress her up and have fun! Great find. She looks like you could have an awful lot of fun playing dress up and decorate. Oh Beti, she's gorgeous! I've been looking for one of my own, they're rare as hens teeth here (Australia). Have fun with her, just a little TLC needed reallly. She'll make a great jewellery backdrop! Focus on Life: Take a walk! Bead Soup 7: Second Reveal!